perf 11½, no watermark, litho. Printed by Juan H. Kidd & Cia, Buenos Aires. The island of Tierra del Fuego lies off the southern tip of South America, just below where Chile and Argentina end. It is separated from the mainland by the Straits of Magellan. The Tierra del Fuego island is divided down the middle with the western half being Chilean and the eastern half being Argentinean. In 1890, Julio Popper of Romania obtained a license from the Argentinean authorities to mine for gold in the eastern regions. Popper described himself as an excellent mining engineer as well as a shrewd businessman. Others described him as a self-appointed dictator over the inhabitants. As part of his business practices, Popper established his own local mail service to move letters from his scattered mining camps to the nearest postal authorities in Argentina (Ushuaia) or Chile (Punta Arenas). Some people interpreted this as providing a valuable service. Others suggested that Popper was taking advantage of the situation and extorting his under-paid miners. 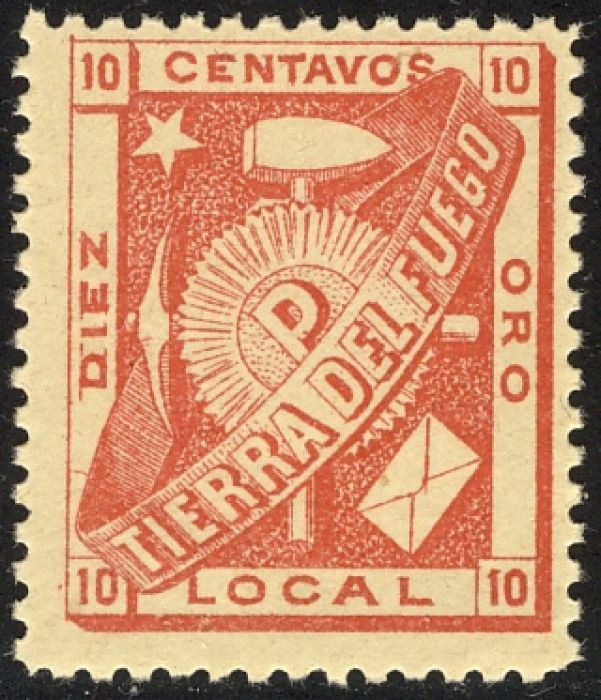 Whatever the morality of this service, Popper had a supply of stamps produced in 1891 by Juan H. Kidd & Company in Buenos Aires and shipped to the island. The Tierra del Fuego stamp was designed by Rudolfo Soucup and contains many iconic pictures referencing Popper’s mining business. In the center is a ribbon inscribed with TIERRA DEL FUEGO that encircles a sun with the letter P (for Popper). A mining hammer and a mining pick axe lie behind the sun with the hammer being vertical and the pick axe being horizontal. In the lower right is an envelope. Along the bottom is the word “LOCAL” to distinguish it from the Argentinean postal service. On the left, top and right are the words “DIEZ”, “CENTAVOS”, and “ORO”. At least one expert in this area believes that the stamp could be purchased for either 10 centavos or 10 grams of gold dust. Sources: SGP20 , FICC Journal v19n1p8 .